Due to the destruction of the ozone layer, we are exposed to radiation that is becoming stronger and stronger. We now know that this harmful radiation reaches the invisible, ethereal body, known as the aura, before it touches our skin. Damage to the physical body only arises after the aura’s protective shield has already been considerably weakened. Therefore, PHI has developed an aura spray for strengthening our aura’s natural protective shield. It is a special composition that combines gem-energy essences, which absorb harmful radiation and cleanse the aura, with flower and orchid-energy essences, which deflect radiation away from the body. 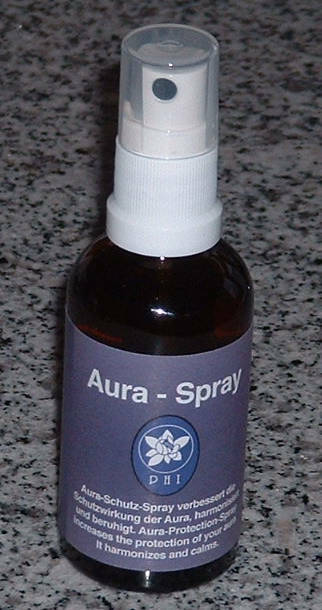 Together with the high vibrations of pyramid-energy essences, this spray creates a sun screen or protective effect that strengthens the aura’s natural defenses. Can also be mixed with sun-cream.